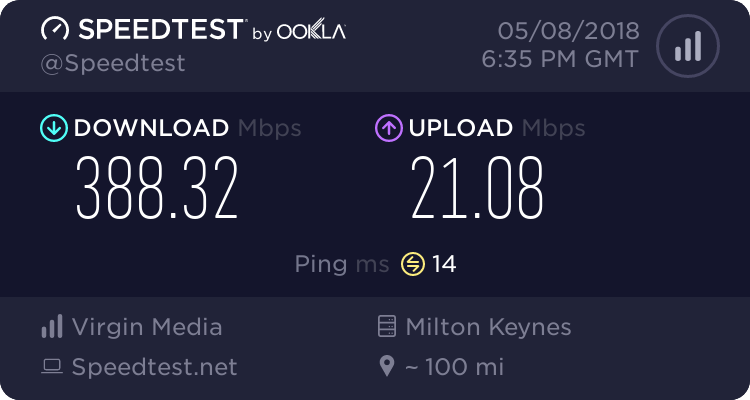 ~ How fast is FTTC & what speed will I get? The current maximum speed is 'up to' 80Mbps downstream and 'up to' 20Mbps upstream. In the UK FTTC can be provisioned as 80/20, 40/10 or 40/2. There is also an 18/2 Openreach product, I believe? Kitz will add a note to the ToDo list, for action when time permits. Edit: I see Purple Sheep has already flagged up the 18/2 . . . my paws are slow, today. Ha ha ..... similar to Harry Potters 'Invisibility Cloak' ....... my newly acquired 'Purple Jacket' turns me into a demon-typer !! I've actually already answered a question in the FTTC/FTTP section, that hasn't yet been asked.